This post came to me after talking with an author about a novel she was working on. In it, a Texan cattle rancher moves north and takes over a relative’s dairy farm. As we talked about her plot and characters and storyline, I realized that a lot of people probably don’t know that running a cattle ranch and running a dairy involve two different sets of skills and knowledge. Yes, they both involve cows, but the similarity pretty much ends there. So let’s take a look at some of the fundamental differences between the two kinds of “cow farming” and see what our rancher is going to need to know to switch from ranching to dairy. Most beef cows begin life at a cow-calf operation. This is the part of beef cattle production that people typically think of as “ranching” — where female cows are bred to produce young “feeder cattle.” Cow-calf operations often keep bulls and allow breeding to happen naturally. Young male calves are castrated and become steers, to be sold for beef. 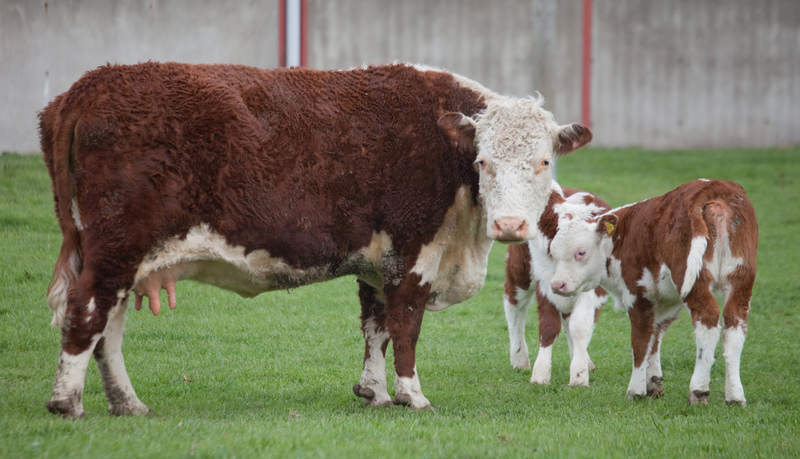 Some female calves may be kept for breeding; the rest are sold for beef. Cow-calf operations typically pasture their animals and/or feed them grains. Almost all beef ranches in the US are family-run, handed down from generation to generation, and most keep fewer than 50 animals. But some are more industrial, with 100,000 cattle and selling hundreds of calves every day. 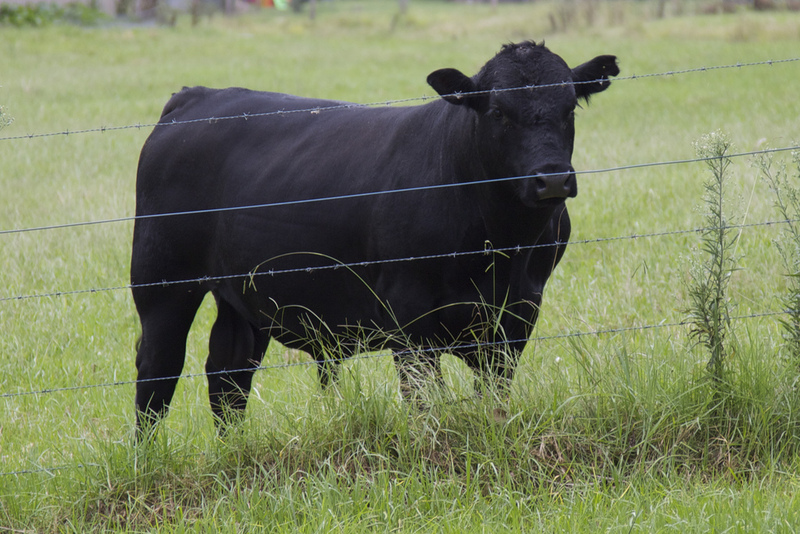 The young cattle are sold at auction as weanlings or are sold directly to slaughter at one to two years old. Those going to auction are brought in to feed yards for pre-conditioning or “backgrounding” before sending them off. During preconditioning young cattle get used to being away from their mothers, learn to eat from troughs, and are fed until they are strong and heavy enough (about 650 lbs) to be sold at auction and withstand life in a feedlot. 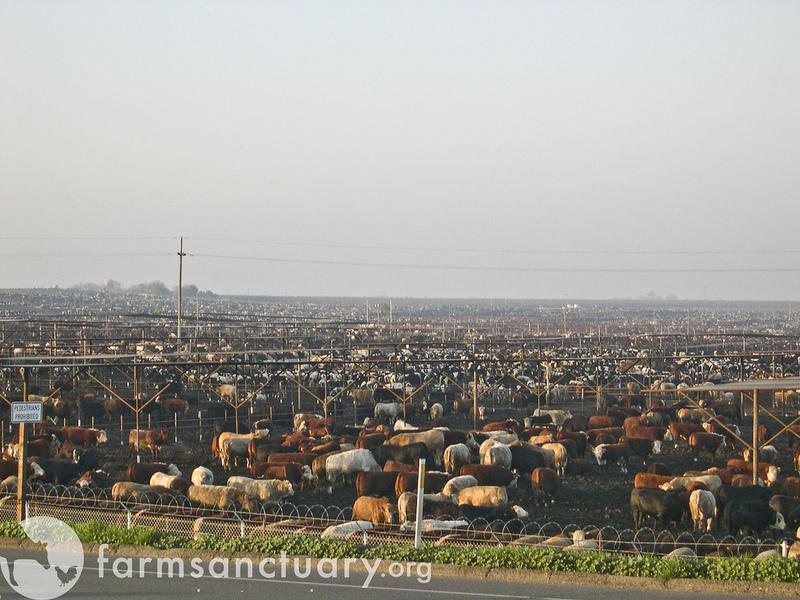 Feedlots are industrial scale operations where cattle are sent to be fed to get them up to market weight. At any time, thousands of animals will be in a single feedlot which consists of acres of muddy pens of tightly packed cattle. The animals are fed an energy-dense mix of corn and grains, plus antibiotics to stave of digestive disorders brought on by their unnatural diet and lifestyle. Within three to four months, feedlot cattle reach market weight of over 1000 lbs and are shipped to slaughterhouses. Life of a (Beef) Farmer Video Series – Excellent month-by-month account of life on a family farm. The Guardian: I am a US Cattle Rancher: What do you want to know? 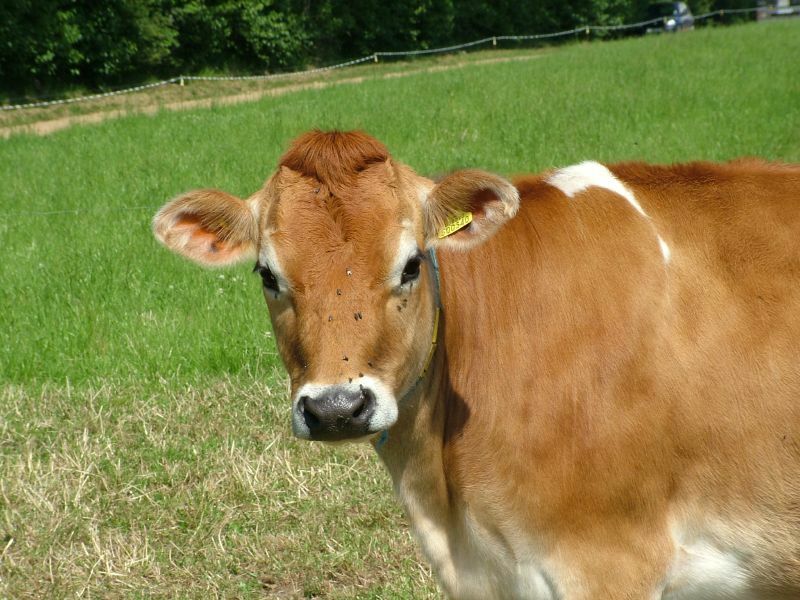 Dairy cows are more often referred to as cows than cattle. They are generally tall lanky animals whose bodies seem to hang from their backbones, shoulders and hips. Mature dairy cows are easily recognized by their pendulous udders. Dairy cows are raised on a dairy farm and the herd is made up of milk cows and their young. Dairy farms seldom include a bull. Animals are normally bred via artificial insemination. Cows are bred annually. Calves are taken from their mothers within days of their birth and moved to a calf-barn where they are bottle-fed. One a cow has given birth she is milked until she becomes pregnant the next season. Female calves may be kept and added to the milking herd or may be sold as breeding milk cows. Male calves are sold for veal or beef. A typical cow is milked about 300 to 320 days per year. While she is in milk, a cow must be milked every day or she will begin to “dry off” and may completely stop producing milk. A cow in full milk production also risks an udder infection – mastitis – if she is not milked regularly. Cows with mastitis must be milked but their milk may not be sold. Dairy cows are pastured during the day (or sometimes housed indoors) and are brought in, either two or three times a day to be milked in a milking parlour. 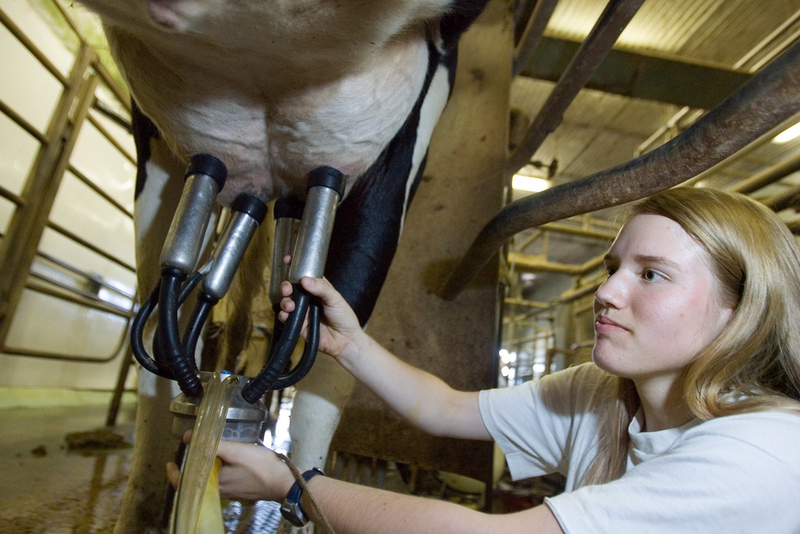 They are hooked up to milking machines that draw the milk from their udders through a system of pipes to a bulk tank, where the milk is stored until it picked up by the milk truck. Milk is measured by weight and dairy cows are rated by the number of pounds of milk they produce and by the fat content of their milk. 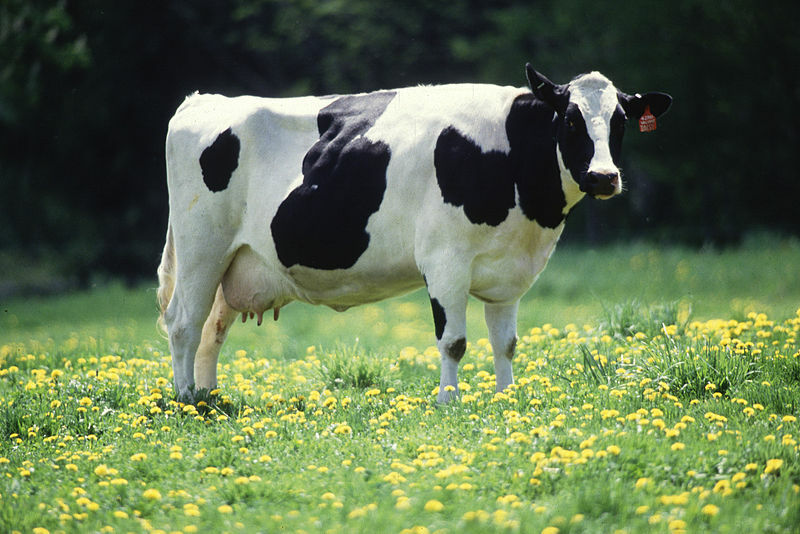 The average dairy cow produces 9164.4 kg (20,204 lbs) of milk per year. Because keeping a cow in milk as long as possible is critical and because dairy farmers use artificial insemination to breed dairy cows, dairy farmers need to understand the breeding cycle of cow, be able to tell when cows are in estrus, and must establish a strong systematic breeding program. Final word: In your writing, do not refer to farmers’ or ranchers’ “wives.” Spouses are full partners in any farming endeavor. Both are farmers or ranchers. Hmmmmmm, vaguely reminiscent of your experience while working at Notter’s dairy farm in Holyoke, CO. So please elaborate why you like the Brown Swiss and those little Jersey cows as well. You got me there. I do love those Brown Swiss, with their long eyelashes and fuzzy ears, and, in my experience, sweet dispositions. That month living and working on a dairy farm was quite the experience. Gave me a huge appreciation for the work farmers do. It’s a 24 / 7 /365 day a year job that makes everyone else who complains about their job look like whiners. I have never met such good hard-working people. Let’s hear it for the family farmers!